This new release will give you an inside look upon the making of Elvis' 25th movie Clambake. This book with over 400 pages contains more than 600 pictures. Most of them never published before and in fantastic colors. Get a glimpse behind the scenes through well researched information about the movie and the actors, anecdotes from the set, the movie's recording sessions, the Clambake discography plus a large selection of memorabilia from around the world. In addition to that the book contains a reproduction of the original movie script. One of his WORST MOVIES and now a book? I don't think so. 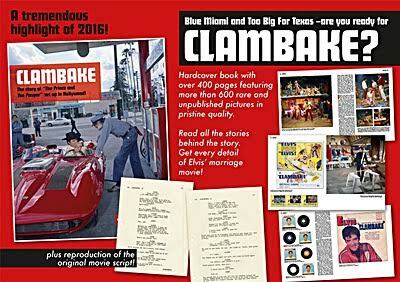 400 pages of the film clambake. who want and can buy this book with all that is released en will be released in the near future. i defenitely won't. Altough it could be a fine book..